TORONTO (July 26) — It’s no secret in National Hockey League circles that the New York Rangers are looking for a center; the Toronto Maple Leafs a defenseman. The Rangers are apparently dangling 30–year–old Nick Holden while the Leafs may have diminished regard for Tyler Bozak, even after the 31–year–old put up a career–best 55 points last season; centered the club’s most reliable forward unit (with Mitch Marner and James van Riemsdyk) and continued to excel in the face–off circle. So… what to do? I’m not certain this would be an equitable trade were it still the pre–salary cap era. As it stands, the Rangers are reportedly less than $500,000 beneath the cap ceiling. Swapping Holden’s $1.65 million cap–hit for Bozak’s $4.2 million is therefore unfeasible (both pacts expiring after next season). Toronto might have to take on another contract… or the Rangers would need to make room elsewhere. It is still nearly 2½ months before the first puck–drop in October, so possibilities abound. With respect to a hockey trade, this would fill a small hole for the Maple Leafs and a crater for New York. Holden is a decent offensive defenseman, coming off a career–best 11 goals and 34 points in 80 games. But, the Leafs already have three–such blueliners in Jake Gardiner (46 points), Nikita Zaitsev (36) and Morgan Rielly (27 points in an off–year). As in baseball with pitching, a hockey team can never have “too many” defensemen. In order to move toward Stanley Cup contention, however, the Leafs must either acquire or develop a Norris Trophy threat. Adding another warm body to the blue line (with no salary control beyond 2017–18) while sacrificing Bozak would accomplish nothing more than creating $2.55 million in cap space. From my perspective, a rather poor exchange for the Maple Leafs. I’M ADDICTED TO OPIUM: Or, such was the general reaction to my Tuesday blog (http://bit.ly/2gWGO86) that merely suggested the Leafs think about converting the multi–talented William Nylander from forward to defense. Clearly, without obligation. In other words, if it doesn’t work, Willie goes back to the wing. Most avid fans wear horse–blinkers and the notion of Nylander as a defenseman barely resonated. Even if it might potentially plug the biggest hole on the roster and allow the Leafs to keep all of Nylander, Marner and Auston Matthews in the expected salary Armageddon of 2019–20… without unbalancing the inventory. 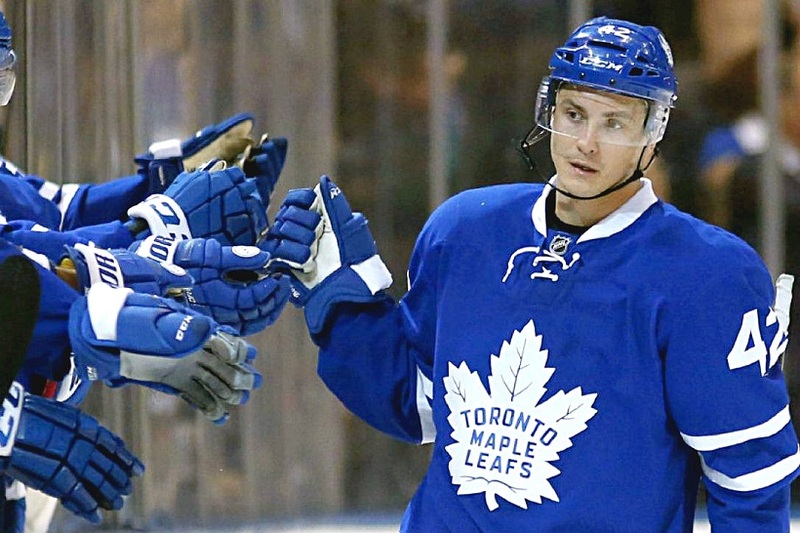 Then there was this TV opinion from a former NHL executive: “The Leafs won’t have to pay Tyler Bozak or James van Riemsdyk after next season. They’ll invest that money into signing all of Nylander, Marner and Matthews.” Unsaid, and more–than–likely not considered, is how the club might replace the 47 goals and 117 points accrued by Bozak and JVR in 2016–17. Apparently, this doesn’t matter. Or, will be accomplished for free. It shows how easy it is to make half–an–argument and satisfy denizens of the Blue and White. I still laugh, 23 years later, when recalling the startled look on Morrison’s face. 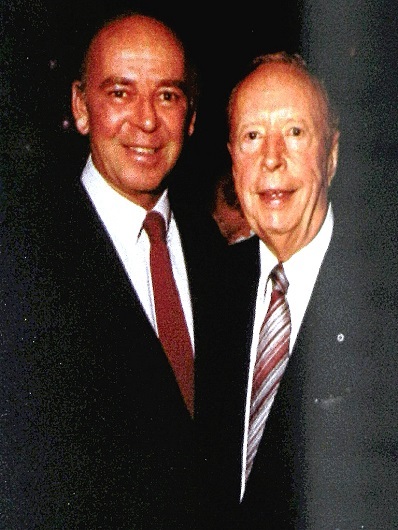 THE COVER OF BOB COLE’S MEMOIR AND AN INSIDE–PHOTO WITH THE LATE FOSTER HEWITT. 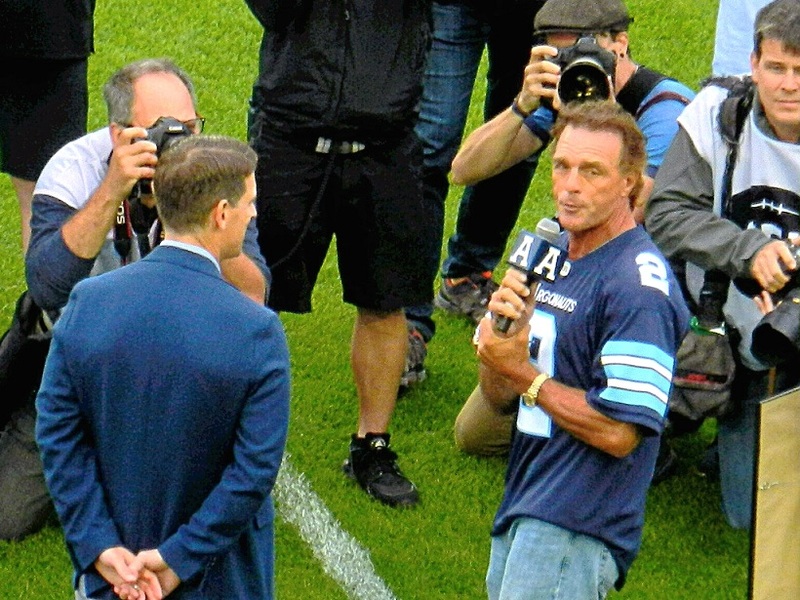 DOUG FLUTIE, STANDING TO THE RIGHT OF ARGOS PRESIDENT MIKE COPELAND, ADDRESSED THE BMO FIELD CROWD DURING MONDAY NIGHT’S PRE–GAME CEREMONY. 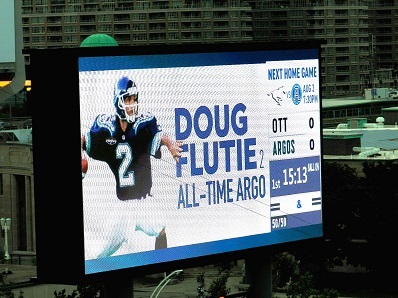 A PANEL OF CFL OBSERVERS, SEVERAL YEARS AGO, VOTED FLUTIE THE GREATEST PLAYER IN LEAGUE HISTORY. 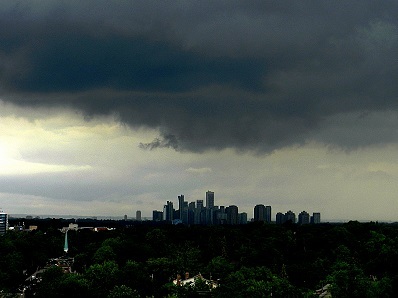 THE WEATHER GODS WERE UNKIND TO THE ARGOS THROUGHOUT MONDAY. 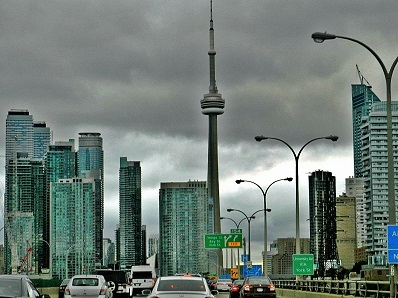 DARK, OMINOUS CLOUDS COVERED THE CITY DURING THE DAY… AND WHILE I DROVE ALONG THE WESTBOUND GARDINER EXPRESSWAY TOWARD THE STADIUM 90 MINUTES BEFORE GAME TIME. STILL A MUCH–IMPROVED GATHERING OF CLOSE TO 16,000 SHOWED UP FOR THE GAME, AND THE CEREMONIES. 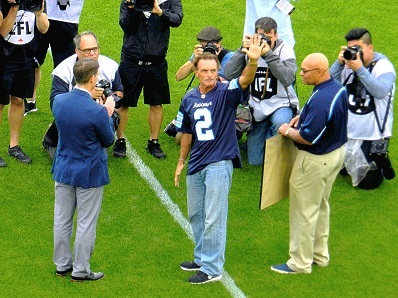 FLUTIE WATCHED A HIGHLIGHT–PACKAGE OF HIS CAREER ON THE VIDEO–SCOREBOARD IN THE NORTH END ZONE; WAVED TO THE CROWD (BELOW) AND SHOOK HANDS WITH REFEREE AL BRADBURY. 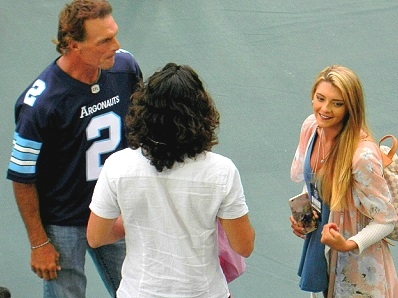 FLUTIE’S 28–YEAR–OLD DAUGHTER, ALEXA, WAS ON HAND FOR MONDAY’S FESTIVITIES. 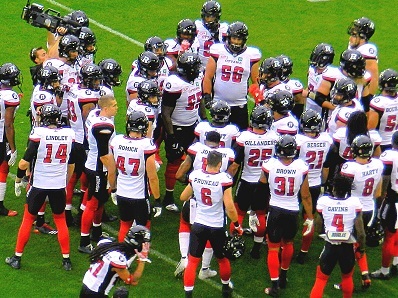 THE OPPONENTS: DEFENDING GREY CUP–CHAMPION OTTAWA REDBLACKS, AND THE ARGOS. 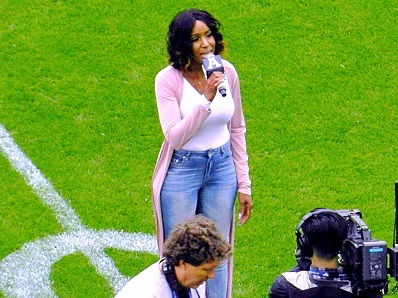 DIANE CLEMONS, WIFE OF ARGOS LEGEND MIKE (PINBALL) CLEMONS, BEAUTIFULLY SANG THE NATIONAL ANTHEM. 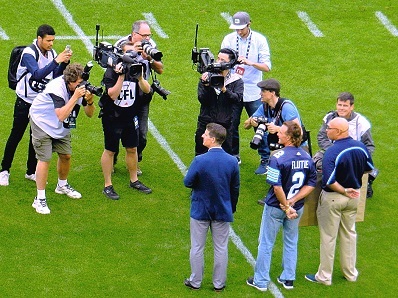 A SWARM OF TV PERSONNEL AND PLAYERS FROM EACH TEAM THEN LOOKED ON AS FLUTIE CONDUCTED THE PRE–GAME COIN TOSS. 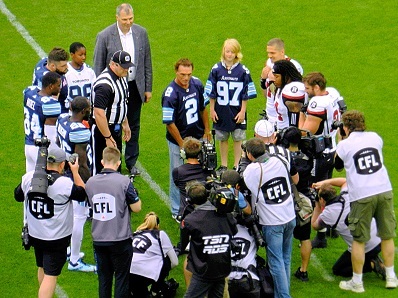 ALSO WATCHING, AT TOP, IN THE GREY SPORTS-COAT, WAS NEW CFL COMMISSIONER RANDY AMBROSIE. 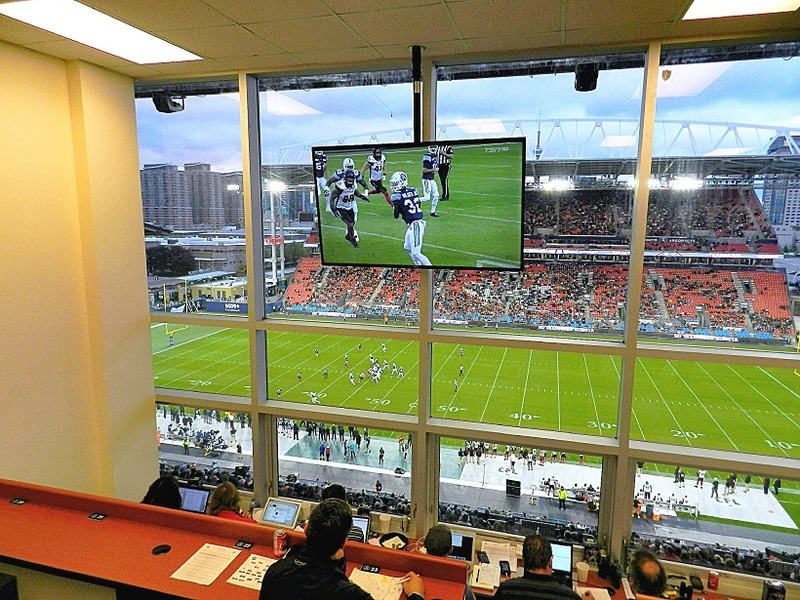 WIDE–ANGLE VIEW FROM THE FOOTBALL PRESS BOX AT BMO FIELD. 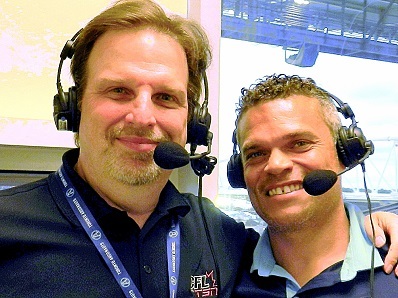 LEFT: CALLING THE GAME FOR THE ARGOS’ FLAGSHIP RADIO STATION, TSN–1050, WERE MIKE HOGAN AND EX–ARGO FULLBACK JEFF JOHNSON. 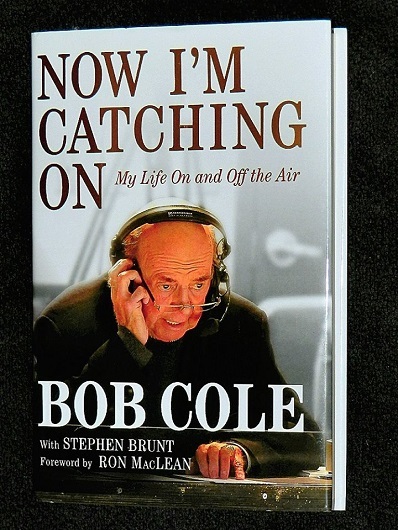 HOGIE AND I WORKED TOGETHER AT THE FAN–590 FOR 20 YEARS. 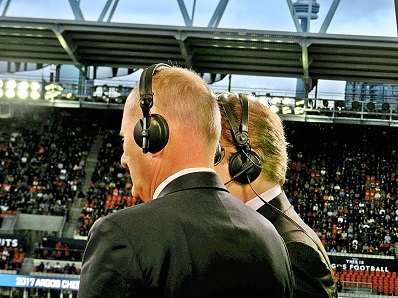 RIGHT: CHRIS CUTHBERT AND GLEN SUITOR CALLED THE MATCH ON NATIONWIDE TELEVISION FOR TSN. THERE ARE FEW BETTER TANDEMS ON EITHER SIDE OF THE CANADA/U.S.A. BORDER. 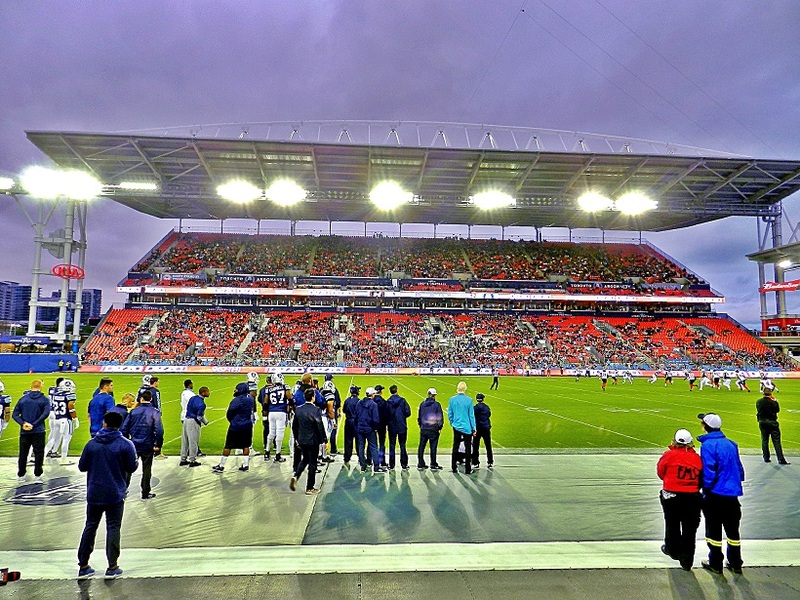 WIDE–ANGLE VIEW FROM BEHIND THE ARGONAUTS’ BENCH ON THE WEST SIDE OF BMO FIELD. 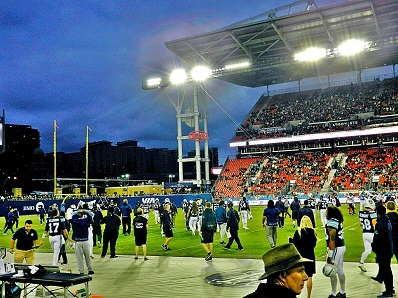 ARGOS QUARTERBACK RICKY RAY RELAXED ON THE BENCH MOMENTS BEFORE THE CLUB LEFT THE FIELD AT HALFTIME. 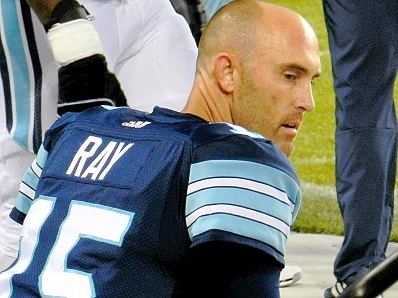 RAY AGAIN PASSED FOR MORE THAN 300 YARDS IN THE TORONTO VICTORY. TWO OF THE GREATEST QUARTERBACKS IN CFL HISTORY CHATTED ON THE SIDELINE AT HALFTIME. 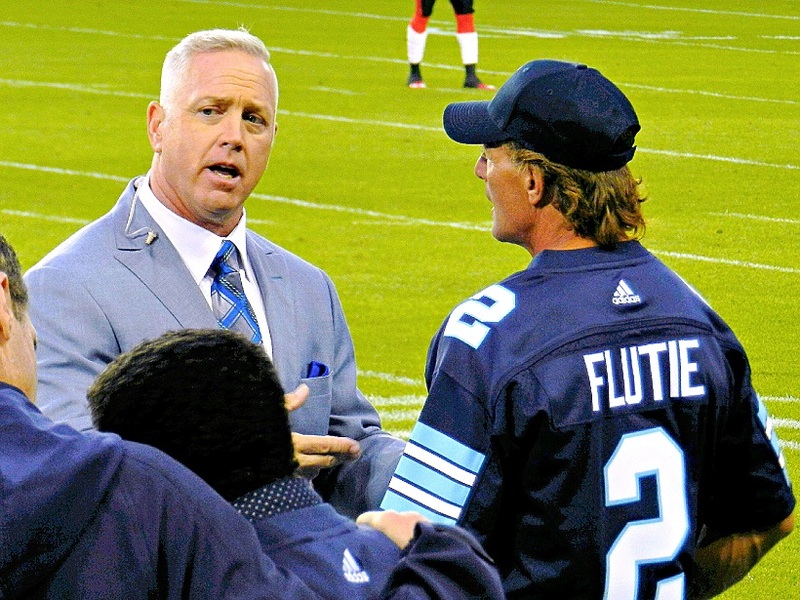 MATT DUNIGAN, NOW A TSN ANALYST, GUIDED THE ARGOS TO THE 1991 GREY CUP OVER CALGARY, DESPITE PLAYING — IN ICE–COLD WINNIPEG — WITH A CRACKED COLLARBONE. 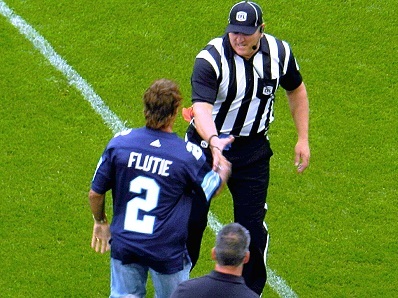 FLUTIE’S BACK–TO–BACK CHAMPIONSHIPS HERE IN TORONTO (OVER THE EDMONTON ESKIMOS IN ’96; THE SASKATCHEWAN ROUGHRIDERS IN ’97) WERE ACHIEVED BY A COMBINED SCORE OF 90–60. 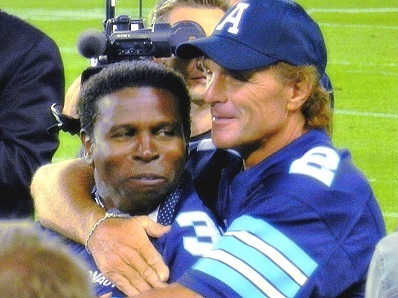 AS THE ’96 / ’97 ARGOS GATHERED TO BE INTRODUCED, FLUTIE HUGGED PINBALL CLEMONS. 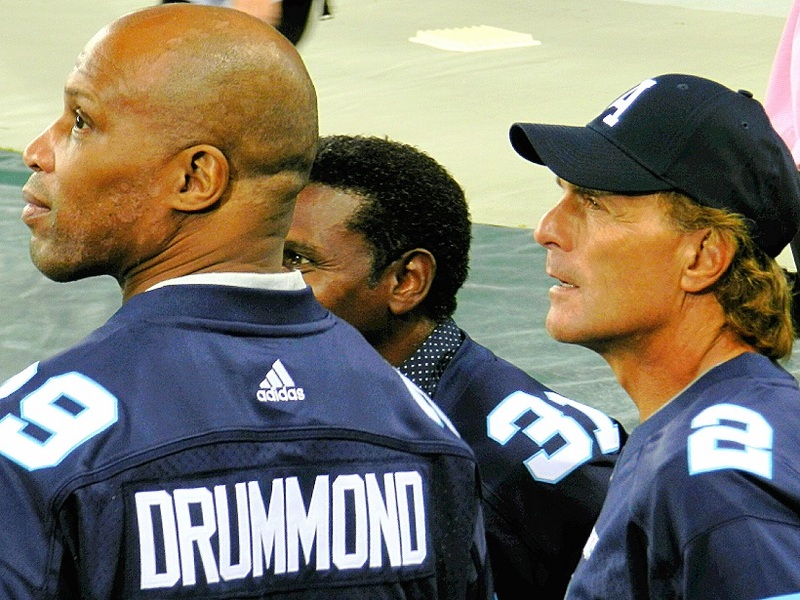 ARGUABLY THE GREATEST BACKFIELD IN ARGONAUTS HISTORY: FLUTIE, CLEMONS AND FULLBACK ROBERT DRUMMOND. CLEMONS AND DRUMMOND WERE EQUALLY EFFECTIVE AS RUNNERS AND RECEIVERS. FLUTIE GOT THE BALL TO THEM ON NUMEROUS OCCASIONS EACH GAME. 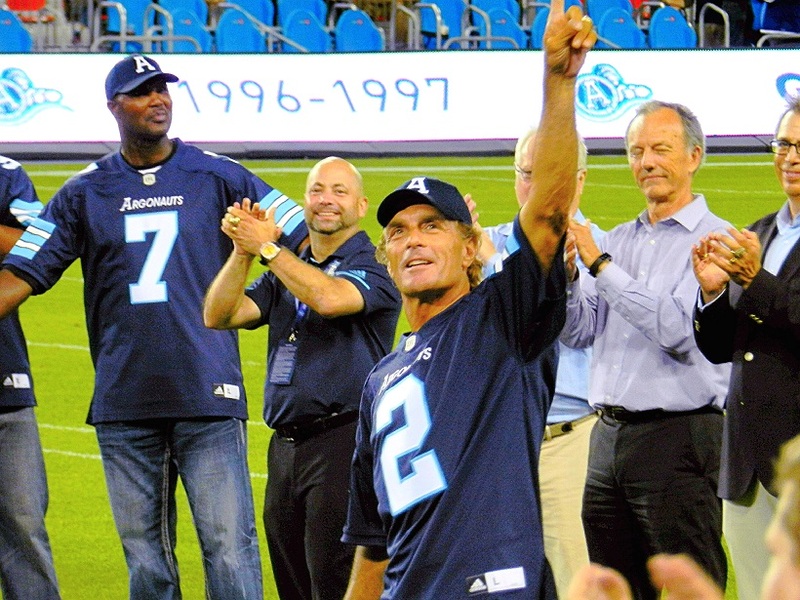 FLUTIE SALUTED THE BMO FIELD CROWD AFTER BEING INTRODUCED AT HALFTIME. 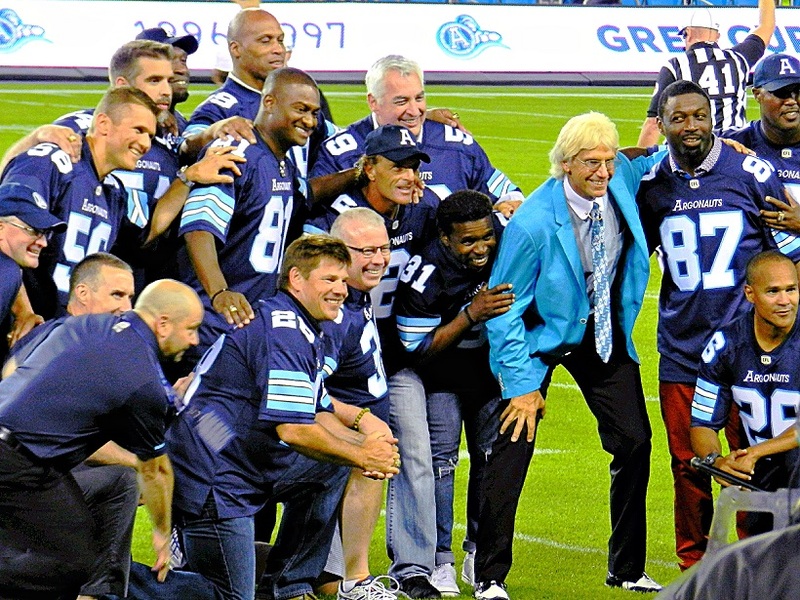 AMONG THOSE APPLAUDING, SECOND FROM RIGHT, WAS BOB NICHOLSON, PRESIDENT OF THE ARGOS IN ’96 AND ’97. 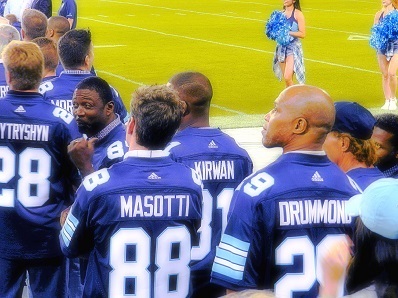 THE OL’ ARGO GANG FROM 20 YEARS AGO: CONSERVATIVELY–ATTIRED, IN THE LIGHT–BLUE JACKET, WAS JOHN JENKINS, THE CLUB’S OFFENSIVE COORDINATOR IN 1997. HE HAD HIS ARM AROUND DARRELL (MOOKIE) MITCHELL (87). KNEELING BELOW WILSON WAS KELLY WHILTSHIRE (26). FLUTIE, CLEMONS (31) AND DRUMMOND (AT TOP) WERE ALSO JOINED BY (LEFT–TO–RIGHT): CHAD FOLK (58); JEREMY O’DAY (54); ANDRE KIRWAN (81) AND PIERRE VERCHIVAL (59). KNEELING, LEFT–TO–RIGHT, WERE EQUIPMENT MANAGER DANNY WEBB (GLASSES); ATHLETIC THERAPIST GERRY TOWNEND (NOW WITH THE NHL’s OTTAWA SENATORS); JASON COLERO, THE CLUB’S LONG–TIME DIRECTOR OF EDUCATION AND COMMUNITY PROGRAMS; DUANE DMYTRYSHYN (28) AND BRENDAN ROGERS (36). 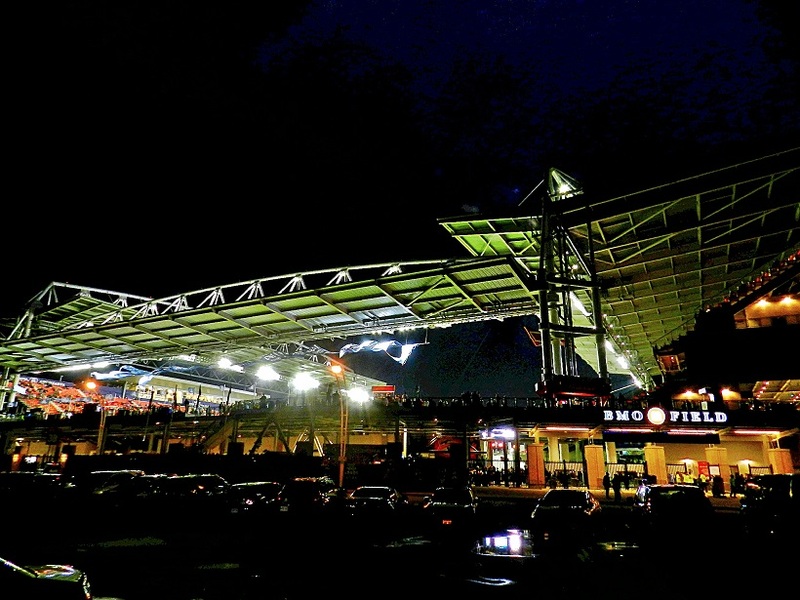 BMO FIELD. AT NIGHT. AFTER THE FOOTBALL GAME. 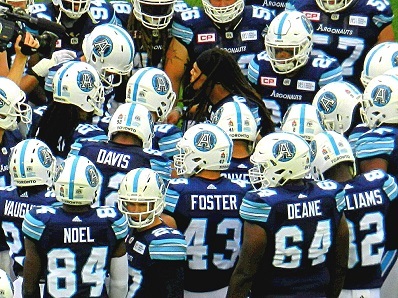 Howard, were you aware, or was anyone else that the last 4 Argo Grey Cup-winning QB’s were all at BMO on Monday, Dunigan, Flutie, Damon Allen and Ricky Ray. It was quite the evening, and I hope to make it to a game at BMO sometime this season.